"Whether you're new to the whole concept of databases, or a hard-core database geek, you need to have The Manga Guide to Databases. Really, you want this book." Princess Ruruna is stressed out. With the king and queen away, she has to manage the Kingdom of Kod's humongous fruit-selling empire. Overseas departments, scads of inventory, conflicting prices, and so many customers! It's all such a confusing mess. But a mysterious book and a helpful fairy promise to solve her organizational problems—with the practical magic of databases. Examples and exercises (with answer keys) help you learn, and an appendix of frequently used SQL statements gives the tools you need to create and maintain full-featured databases. This EduManga book is a translation of a bestselling series in Japan, co-published with Ohmsha, Ltd., of Tokyo, Japan. Mana Takahashi is a graduate of the Tokyo University, Faculty of Economics. She is an active technical writer and has published a number of books on topics such as Java, C, XML, Information Engineering, and System Administration. Chapter 1: What is a Database? Chapter 2: What is a Relational Database? "This is a solid book and I wish there were more like it in the IT world." 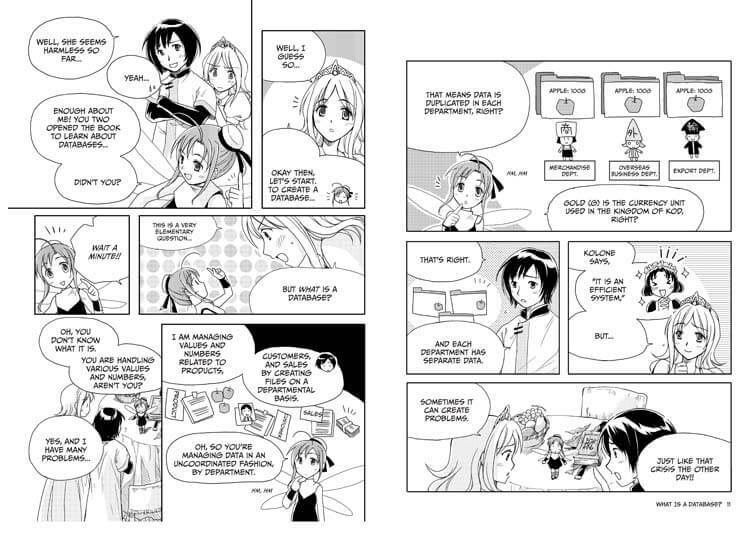 "Without a doubt, The Manga Guide to Databases was the most enjoyable tech book I've ever read. . . . I loved this book and highly recommend it if you'd like a beginner's book with a fun overview of databases, served up manga-style." "For an American audience, this is certainly off-the-beaten-path approach to technical training. However, its ability to effectively plunge into a topic that can be a morass of arcane theory is undeniable. Over the years, we've learned to expect the unexpected from No Starch Press." "This book is by far the best book I have read on the subject. I think this book absolutely rocks and recommend it to anyone working with or just interested in databases." "From data tables to flow charts, The Manga Guide to Databases is a valuable resource to students who wish to know more about the process of information manipulation and storage." "If you're in the market to learn more about databases and you hate normal tech books this is a great pickup." "If you need to learn about databases and you're tired of the Databases for Dummies-type fare, pick up this guide! If you plan on running your own business and are a manga fanatic, drop everything and pick up this guide!" "The Manga Guide to Databases is not just a lightweight illustrated treatment of RDBMSs. I like that the book covers different data models, and includes a discussion of some relational operations. The explanations of transactions and ACID principles were very concise and clear. This book gets bonus points for having a thorough index and a 'frequently used SQL statements' cheat sheet." "I tested the book on a genuine teen, my son John. . . When I quizzed him about database design, he really had picked up the essentials. He told me about one-to-one, one-to-many, and many-to-many relationships; the importance of a primary key; and using transactions to avoid corrupting the database." The Manga Guide to Databases "is a light, impressively non-oppressive read, especially considering the technical nature of its subject." "A clear and solid foundation for further study." "SQL is no longer a total mystery to me." "Somehow, it all works together. There's an awful lot of information conveyed as Ruruna and Cain modernize their country." "Those who are just getting started with relational database design and data modeling will find this guide to be entertaining and extremely comprehensive." "It’s relatively easy, completely fun, and explains a lot of how each part of a database relates to another. Besides, Tico the fairy is cute, too!" Question Q13 should read, "What is the largest population of a country in the North Sea District?" In the third panel, the last item in the SELECT phrase should be "quantity" instead of "export_destination." The result of the query in Q4 should be the empty set. The results of the query in Q6 should include "The Kingdom of Minanmi," "The Kingdom of Ritol," and "The Kingdom of Sazanna." or an exclusive lock to other transactions." Q10 should read "Create an SQL statement to revoke the Overseas Business Department's privilege to delete data from the Product Table."